frecnh riviera : In the 15th and 16th centuries, scented gloves were all the rage. Maria de Medici owned 300 pairs! When the fashion for scented leather wore out, Grasse still managed to keep its perfumeries running. 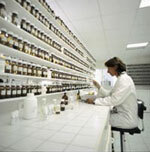 aromatic products frecnh riviera : The new factory located in Saint-Cézaire, near Grasse, was constructed in 1995. To cope with the company's growth, major investments were made in 2009, taking production capacity up to 3000m², and rising to meet the latest European standards in terms of safety, hygiene and respect for the environment. aromatic products frecnh riviera : Over 1,000 natural and synthetic raw materials are constantly in stock, strictly selected for their quality. 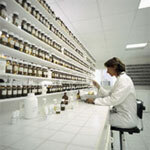 aromatic products frecnh riviera : Gas phase chromatography: for checking the purity of the raw materials in a composition, and for ensuring that manufactured products match control samples. Densimeter, refractometer, flash point tester. aromatic products frecnh riviera : The top-quality raw materials used by SFA offer the company's perfume designers the best means of expression for composing rich formula that generate powerful and subtle emotions. aromatic products frecnh riviera : An olfactory pyramid is the interpretive illustration of a composition. Applying pictures to an olfactory concept that is often abstract, it constitutes a very useful marketing tool for presenting the composition. It makes discussions with the client easier, to reconcile the client's wishes and the demands of the market. aromatic products frecnh riviera : he Directive on dangerous substances and preparations, which defines the different safety symbols, allowing for greater precautions when handling products and labelling the products it sells. - The European Cosmetics Directive REACH: European regulations pertaining to the Registration, Evaluation, Authorisation and Restriction of Chemical substances imported into, or manufactured in, Europe. aromatic products frecnh riviera : Eau de toilette, perfume, eau de parfum, attar… We study how luxurious compositions evolue over time. SFA is as skilled with alcoholic compositions as with alcohol-free compositions. aromatic products frecnh riviera : Liquid soap, solid soap, bath foam, shower gel… The medium determines concentration and colour. aromatic products frecnh riviera : This ancient and rich know-how has been almost lost with the arrival of synthetic raw materials. SFA founds in its past and value Grasse expertise on natural raw materials, to create nowadays modern formulas for product ranges, certifiable by different international labels.